L-R: Pharm. Dr, Rawlings Odigie, Pharm. Ikechukwu Ugwoke, Pharm. Omole Ogunniran, the Assistant General Manager (AGM) Pharmacy, NPA, Dr. Mrs. Christiana Akpa, Pharm. Victory Ebidame, Pharm. 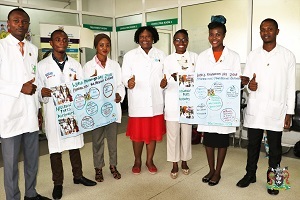 Tina Eze, and Pharm. Aigoro Adeniyi during the celebration of World Pharmacists Day at the NPA Clinic, Bode Thomas, Lagos, today. 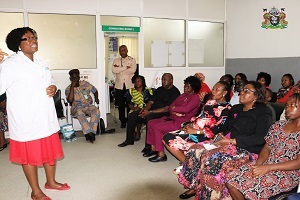 The Assistant General Manager, (AGM) Pharmacy, Nigerian Ports Authority (NPA) Dr. Mrs. Christiana Akpa (left) addressing Stakeholders and participants during the celebration of World Pharmacists Day at the NPA Clinic, Bode Thomas, Lagos, today.